Tamarind. A sour-sweet fruit, sometimes known as the Indian date, used as a souring agent. It comes in long, dry brown pods which look almost like dried broad bean pods. Inside is a long, segmented fruit, like a long brown caterpillar. Each segment contains a hard, shiny black seed. As the pods dry the fruit becomes sweeter. 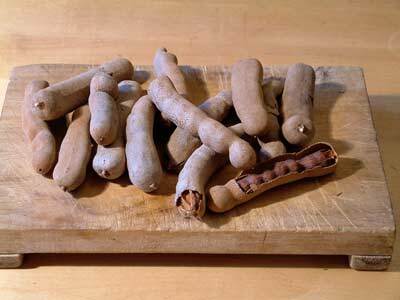 A visitor from Mauritius suggested shaking the tamarind and, if you could hear that the fruit had detached and was rattling a little inside the pod, you would find that the fruit was sweet. All you need to do is to remove the pod and then chew the fruit, discarding the seeds. It is also available mashed and formed into a pulpy block or as a juice. In this form it is used like lemon juice.